The Baryshnikov Arts Center presents Joanna Kotze’s dance “Find Yourself Here” in the Howard Gilman Performance Space on September 16, 2015. Photo Credit: ©Stephanie Berger. After making three shorter trios, each between two dancers and one visual artist, Kotze – who in 2013 won a Bessie Award for Outstanding Emerging Choreographer, and also holds a B.A. in Architecture – now brings together dancers Stuart Singer and Netta Yerushalmy (with whom she previously worked in It happened it had happened it is happening it will happen), and visual artists Zachary Fabri, Asuka Goto, and Jonathan Allen (her husband), whom all perform alongside Kotze. All six dance and all six deal with the material elements in the space. The composition of moving bodies in space and time; this is a bread-and-butter definition of choreography. Not that defining choreography in concrete terms is at all useful. That description says nothing of conceptuality, politics, emotionality, or any of the other myriad lenses through which we might read a piece of dance. What is fundamental to that description is form; plastic and malleable, temporal, an Apollonian art. My question then is: what can the form affect in me? The work is so dense that it would be useless to attempt to recount everything. The piece unfolds like a series of self-contained sections: Linoleum squares in playhouse colours arranged in a Tetris-like map, each tile removed from one position to continue the design at another. Addition via subtraction; the performers running with super-fast micro-steps in single file, steadily mapping the space with their linear pathways – their faces comically unperturbed by the exertions happening below; a trio between Kotze, Yerushalmy, and Allen shows off the most studied play of fractured movement sequences, their irregular rhythms virtuosically syncronised. What is interesting is the relative constant of speed. Kotze moves from one finely-tuned choreographic proposition to the next with an assured urgency. The ideas fly thick and fast, and while there is an unfolding structural logic, there is something unrelenting in its forward-focused momentum. Part of what defines Kotze’s movement language is her own physicality, which looks as if it’s been pulled from an Art Deco motif off of Rockefeller Center; her body can’t help but describe itself in dramatic lines. Passing through heraldic postures, while systematically dissecting the movement in specific joints and limbs, denying any singularly emotive reading. The extension in the body lends the dance a classicism, intentional or not, that also reveals a deeply rooted attachment to histories of formal choreography – classic, modern, post-modern. The intent forward-thrust also feels like an attempt to shed this saturation of history and move beyond it. Fabri’s movement is the most apparently personal, rougher around the edges. The abundance of movement is measured by sparse design. The performers, dressed by Mary Jo Mecca, wear whites and complementary greys, while the featured uniform shoes provide a spectrum of colour (I absurdly thought “iDance by Apple”). Ryan Seaton’s sound, which he live-mixes each performance, generously supports the space, while occasionally interrupting its weighty atmosphere with electronic spasms. Midway through the piece, Goto spreads open the back wall partition segments to reveal the Manhattan skyline behind, literally expanding the possible horizon. The openness of design belies a fraughtness that persists in the performers. Active attention to form is the fore-grounded performative action in FIND YOURSELF HERE – the title implies this active self-awareness; locate yourself, do it now. I believe this is a conscious choice, to heighten the performative stakes by dialing up the urgency. But I would also guess that this pace is second nature for Kotze, and that her fastidious eye for detail wouldn’t let up even if she wanted it to. Perhaps as an antidote to all this composition, form succumbs to degradation. Bodies losing their sense of clear direction as they feebly punch their fists in the dark, heads bowed; Singer’s eyes transfixed in disorientation as he spins and runs in circles, exhausted; coloured materials thrown haphazardly, fervently organised in one pile and then another, purposefully purposeless. The human body as a functioning object is imperfect, but here, even as it stumbles, it still serves a more perfect ideal of form, never departing entirely from Kotze’s blueprint. Kotze clearly has a great eye for composition; it is a nuanced, deliberate, intelligent construction. And while defining choreography in terms of space and time may seem overly simplified, the work that this actually takes is anything but simple. The question I’m left with is: how does this rational experience of form drop down from the mind and fully reside in the body, both for performer and audience? What’s missing for me in that analogy is the big sheet of glass separating me from the world as it passes by. I observe from a comfortable unaffected distance, and experience the images dispassionately. And I can’t help but feel somewhat dissatisfied by this removed forward momentum. I want to derail that train! 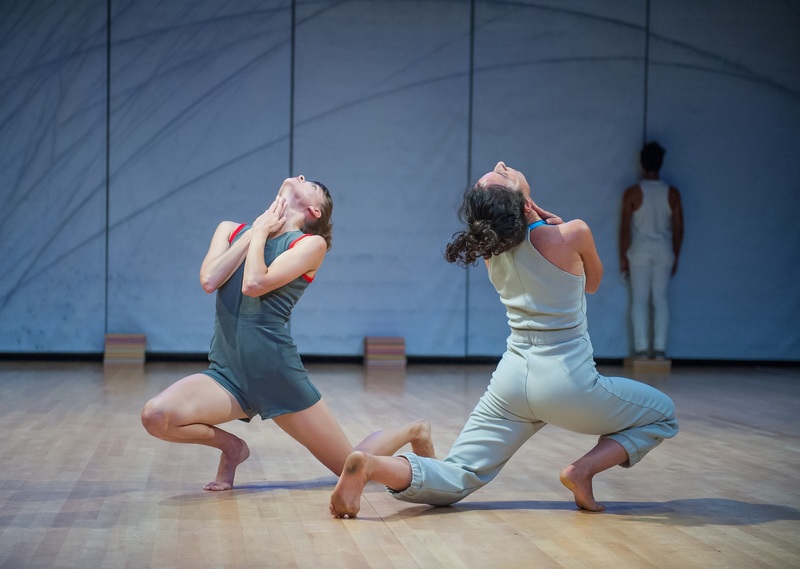 The insistence that drives Kotze’s choreography feels as if she wants to break through this dividing glass, for all this structural work to bridge the gap and be felt by the audience. Maybe all this needed was for the space between us all to relax, for the tightly wound guy-wires of this construction to slacken, so that the piece might be allowed a more organic momentum. The Baryshnikov Arts Center presents Joanna Kotze’s “Find Yourself Here” in the Howard Gilman Performance Space on September 16, 2015. Photo Credit: ©Stephanie Berger.